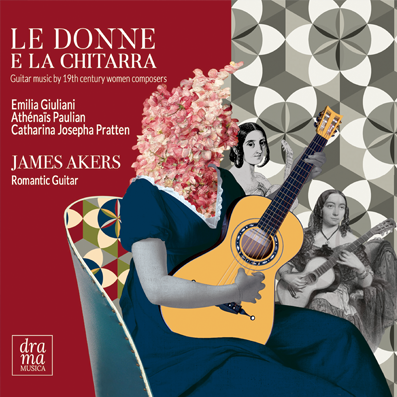 Critically acclaimed musician James Akers was hailed as ‘the great Scottish guitarist’ by Classical Guitar Magazine and, in a review from Gramophone, his playing was described as, ‘containing all the warmth, colour and expressive richness one could hope for.’ Throughout a varied career, James has explored music from historical and stylistic perspectives, combining diligent research with expressive playing to communicate the continuity of musical endeavour through the centuries. James was born in Scotland and as a child played rock and blues guitar before attempting jazz and finally settling on classical music. Largely self-taught before entering higher education, he studied guitar and lute with Rob MacKillop at Napier University, Edinburgh, before transferring to the Royal College of Music, London, with Jakob Lindberg. Following a Junior Fellowship at Trinity College of Music, James has worked extensively as a soloist, accompanist, continuo player, session and theatre musician. He has performed with leading artists and ensembles including: Alison Balsom, Dame Emma Kirkby, I Fagiolini, the Hanover Band, Stile Antico, the Dunedin Consort and the Scottish, English and Irish Chamber Orchestras. Along with major opera companies: English National Opera, Welsh National Opera, Opera North and Innsbruck Festival Opera, he has made numerous appearances on theatrical stages including Shakespeare’s Globe Theatre. James has featured on several film and television soundtracks and broadcasts regularly for BBC Radio 3. As a soloist, James has given recitals throughout Europe of lute and early guitar music. He has researched previously little known repertoire and released premier recordings of forgotten works by significant composers. James teaches period plucked strings and performance practice at The Royal Conservatoire of Scotland.